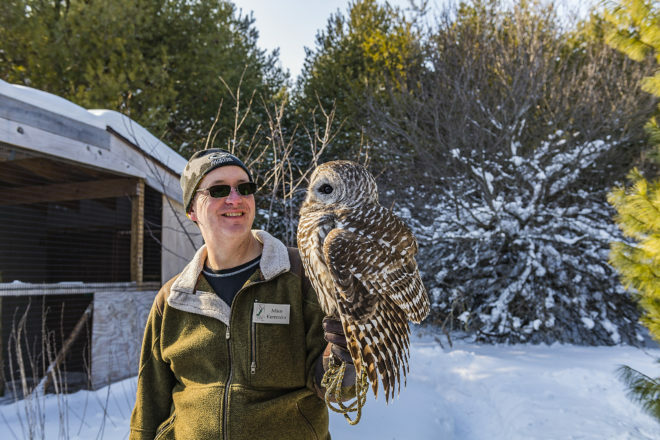 Radar the barred owl at Open Door Bird Sanctuary’s first Winter Open Day. Guests enjoyed hiking, skiing, snowshoeing, hot chocolate and, of course, the birds of Open Door. Photo by Len Villano. Open Door Bird Sanctuary held its first Winter Open Day on Feb. 2, when visitors could hike and snowshoe on the sanctuary’s trails and meet some of the resident birds. Photos by Len Villano.